Funny, but I always thought goldenrod was the source of all those red eyes and runny noses one sees this time of year. Turns out (according to Wikipedia) that the late-summer culprit is another bloomer altogether. 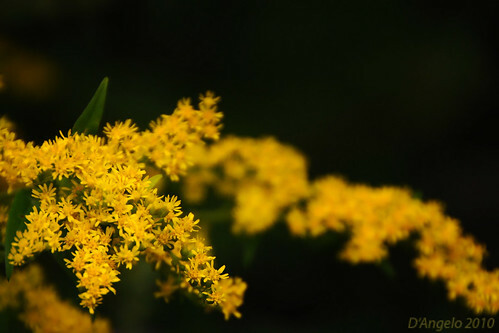 That’s a good thing for us, since we have goldenrod all over the place. 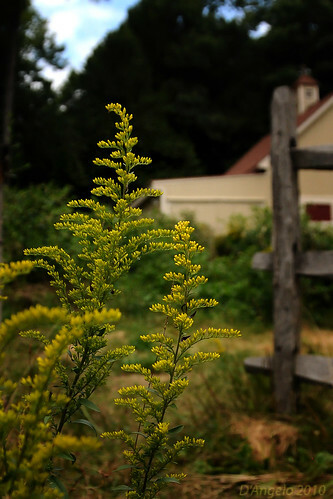 Apt, and also ironic, since the online Goldenrod has been on my mind a great deal lately… but unlike these showy bits of flowering sunshine, the human Goldenrod is not blooming. I’ve been mentally wrestling with myself for days, trying to decide whether to write about this or not. After all, she’s frequently online, and she may very well read this. But Goldenrod is not just another online personae; she’s my mother. And although I don’t know how much I’m going to feel like writing in the days and weeks to come, I do know that I’m going to need an outlet now and again. Just as well nobody reads this blog anymore. I would say “Yea! She’s baaaack!” But, given the tone of this post, that just doesn’t seem right. I’m so sorry to hear this, what with y’all having just moved up North… I went through this with my own mother some years back, and in some ways I am not sure I have recovered. However, I will keep you and your family in my thoughts and prayers, and yes, there are still a few of us around who read your blog. Oh no! I had been checking your blog every now & then to see if there was news of your mom. Just today I got an email from her old bridge partner in Houston to see if I had heard from her. I’m so sorry to hear that she’s not doing well. You and she & your family will be in my prayers. I had the best conversation with her just before her big trip. She had been planning to stop by Xenia to visit me & give me that pink flamingo. We realized that Xenia wasn’t anywhere near where she needed to be so we just had that phone call instead. Thanks y’all, for the kind thoughts. Bug — I can’t actually claim that this is a particularly private blogpost (LOL!). OTOH, I suspect she’d be unhappy with me if she starts getting frantic emails from people asking about what I’ve written. (Like I said, I had to think long and hard about writing on this subject at all…) Ya know? If you like, tell Goldenrod that I care about her. And that other friends in Houston care also. I’ve called and sent an email so I imagine she knows. Just sending wishes for the very best.